The Tornado F5 should be commended for incorporating an accessible LGA 1151 socket and MXM 3.0 slot onto a 15-inch chassis that is smaller and even lighter than many popular and less powerful alternatives. From this perspective, the system is not unlike the Razer Blade Pro - larger-than-life hardware in as compact of a chassis as possible. The fact that we can record no major throttling issues or hidden cut corners that directly affect performance is another notable accomplishment. The Tornado F5 is the most versatile 15-inch gaming notebook available if the accessible LGA 1151 socket and MXM 3.0 slot are of utmost importance. 3DMark results are essentially identical to our desktop GTX 1080 Founder's Edition reference card. In other words, the Tornado F5 offers the same raw graphics power as a loaded desktop without noticeable cut corners if assuming base clock rates. The all-mighty GTX 980M SLI in the older Eurocom X8 is about 10 to 15 percent slower than our much more efficient Tornado F5 configuration. The newly launched GTX 1080 Ti for desktops provides a 35 percent boost over the GTX 1080 according to Fire Strike. Eurocom makes the ultimate stealth gaming laptops. 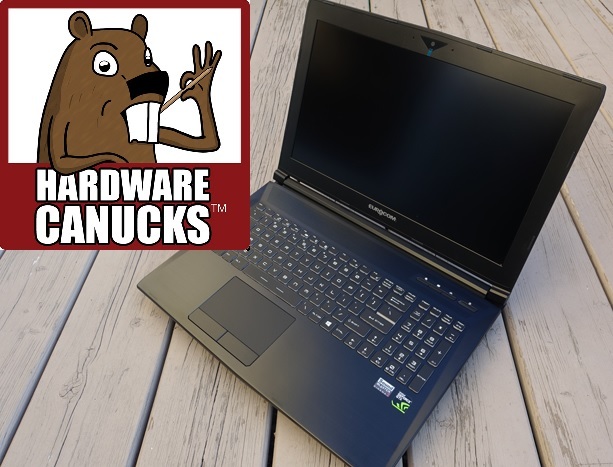 This Canadian-based computer maker is known for their high-powered gaming laptops that typically come in cases suitable for an office. 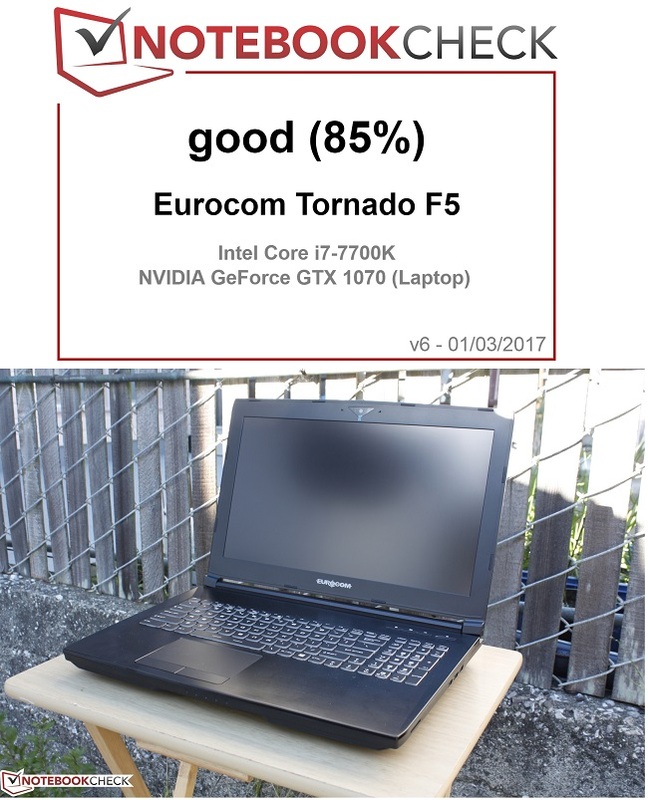 The Eurocom Tornado F5 Gaming Laptop is a perfect example. 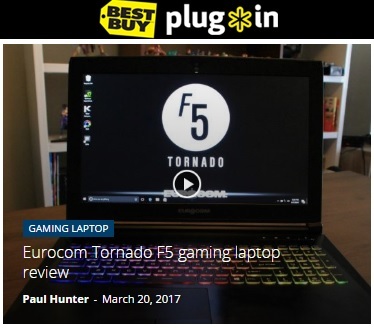 Recently I had a chance to test out the Tornado F5, Eurocom’s newest gaming machine in their SuperGaming “desktop laptop” line. It combines desktop-class components, all housed within a sleek 39 x 26.6 cm laptop chassis. By looks alone, you’d probably never guess the immense power that’s contained inside. With Eurocom though, I’ve learned to not judge a (note)book by its cover. 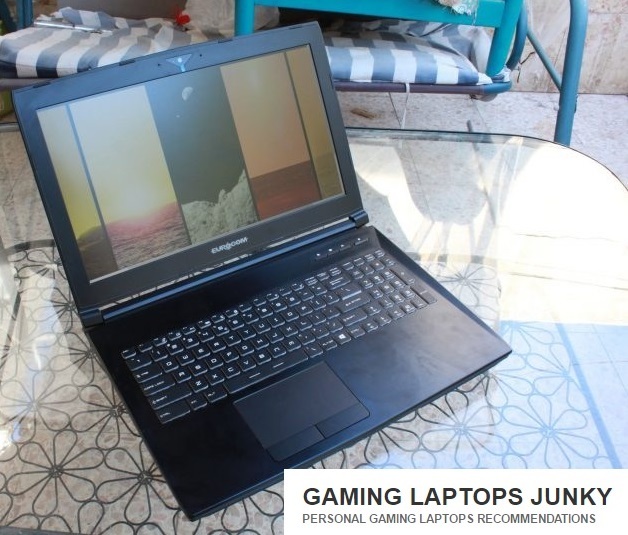 Overall, the Eurocom Tornado F5 is an outstanding gaming laptop. It had stellar gaming performance for every game I tried, even on the highest video settings. The keyboard build is excellent, and I like how many ports the laptop contained. On the chassis’ all-black finish you won’t find any unique design elements, which is good or bad depending on your preferences. Personally I like its subtle look, as you could easily bring into the office then head to the lounge room on breaks to play Mass Effect: Andromeda. 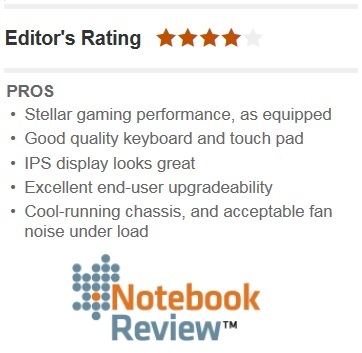 This notebook has some of the best end-user upgradeability we’ve seen, and packs a tremendous amount of power. It may not win many design awards, but it’s king of the hill when it comes to performance in a 15.6-inch chassis. The main selling point for the Tornado F5 is its desktop-class, end user-upgradeable hardware. Unlike most other notebooks on the market, this one has a socketed Intel LGA processor. It can be swapped and replaced as opposed to BGA processors, which are soldered to the motherboard. The processor in our review unit is Intel’s flagship Core i7-7700K “Kaby Lake” quad-core, the fastest offered in the Tornado F5 as of this writing. It has a base frequency of 4.2GHz, and can reach 4.5GHz in its “Turbo Boost” mode. Compare this to the Core i7-7700HQ commonly found in gaming notebooks, which runs at just 2.8GHz, and is limited to 3.8GHz in Turbo Boost. 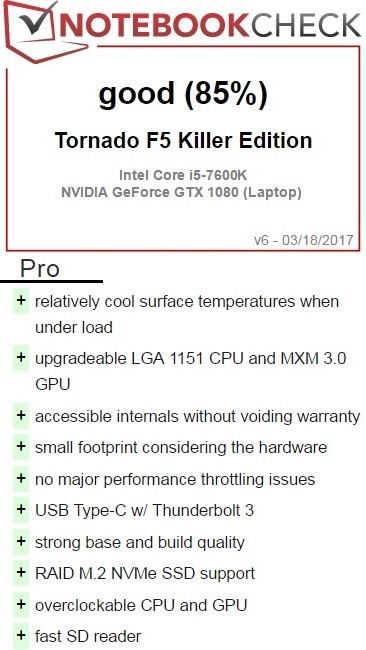 Graphics performance is another selling point for the Tornado F5. 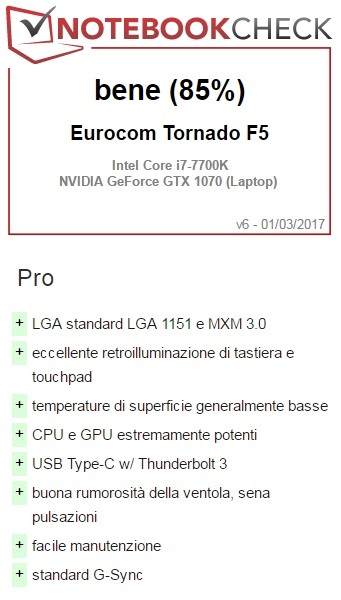 Eurocom offers this model with several different cards, including the VR-Ready Nvidia GeForce GTX 1060 and GTX 1070. We’ve already seen these cards in 15.6-inch notebooks, like the Asus RoG Strix GL502VS and the Gigabyte P55W v6. However, the Tornado F5 also offers the GeForce GTX 1080, which is Nvidia’s flagship mobile card. It’s very close to the desktop GeForce GTX 1080 Founder’s Edition in overall performance. At the time of this review, we weren’t able to find another 15.6-inch notebook that offered this much graphics performance. 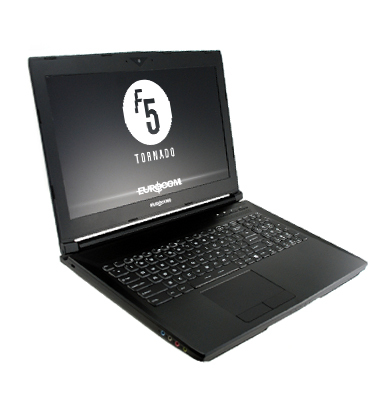 You’ll have a hard time finding a more powerful 15.6-inch notebook than the Eurocom Tornado F5. In a market where most gaming notebooks use lower-clocked mobile processors, the Tornado F5 packs a socketed Intel desktop processor. The Intel Core i7-7700K in our review unit was Intel’s flagship quad-core processor. This notebook is also notable for having the Nvidia GeForce GTX 1080 graphics card as an option, which up until now we hadn’t seen in anything smaller than a 17.3-inch notebook. All told, we’re impressed with the Tornado F5 inside and out. If you prioritize performance and upgradeability in a relatively portable package, this monster should be at the top of your list. My review is going to ignore all that fluff and give you the perspective of a notebook enthusiast that is obsessed with performance, overclockability, upgradability and serviceability. Now, please do not take that the wrong way. The fluff is nice, but it is only icing on the cake. If there is no cake under the icing, or the cake tastes like crap, only a fool or a sugar-addict is going to bother eating it. TL;DR??? Let me summarize this for you in as few words as possible. Stuff a 91 W desktop processor and a 150 W Nvidia GPU in a 15.6-inch notebook and you'll have more processing power in a portable 3 kg system than most full-size PCs. Our test unit is one of the first notebooks to ship pre-configured with an unlocked Core i7-7700K Kaby Lake CPU. Other core specifications and features are just as impressive including the removable GTX 1070 GPU, 64 GB of DDR4 RAM, and NVMe M.2 Samsung SSD. For this review, we want to see how well the new design compares against the competition in addition to how efficiently it can cool both a 91 W desktop CPU and an MXM Nvidia GPU. The Tornado F5 continues the Eurocom tradition of offering faster performance, more customization, and longer legs than the popular equivalents from big name manufacturers. There's no denying that its ability to run on standard desktop processors and removable GPUs without voiding a warranty seal is one of the best aspects of owning a Eurocom system. In an effort to overcome these hurdles, we’ve teamed up with Eurocom since they offer a broad range of drop-in GPU upgrade options for many of their notebook lineups. Provided the mounts are the same and the cooling system compatible, this allows customers to bring their slightly older notebooks up to a more current set of expectations for a fraction of the cost of buying a brand new computer. This also grants us the unique opportunity to test some mobile GPUs in a direct head to head comparison on identical systems. In this case I’m using Eurocom’s 15.6” Tornado F5 chassis which is quite a bit more compact than the ASUS monster and weighs in at 6.5lbs. What it lacks in size it more than makes up for in portability and features. Our sample, which rings in at just under $2100USD, includes an i7-6700K, 16GB of memory, a 256GB M.2 SSD and a 1080P 60Hz G-SYNC display even when equipped with a GTX 1070. All told, that’s a pretty good price considering we’ve already seen very similar notebooks run for hundreds more.